I think it’s critical that organisations agree on a definition of mHealth as it makes little sense to be offering training courses about things that an organisation hasn’t itself yet reached an accepted definition. Failing that it’s interesting to consider alternative definitions that have been put forward by others eg. “What is mHealth”. I think this is a very important point. A lot of people who have worked in telemedicine think that mHealth is a subset. Then get disorientated when I tell them to describe how it’s telemedicine when I’m at 30,000 ft in a plane accessing a full medical library on my smartphone and taking the ECG of a panicking passenger using the Alivecor app. It’s critically important that the healthcare industry understands SMS so please read this fascinating post by Tomi Ahonen from 2010 (also don’t miss his 2013 ‘Mobile Moment’ Almanac). Key takeaways that you will gain include an appreciation of SMS as not just the most widely used ‘data application’ but as the most popular and accessible means of electronic communication eg. back in 2010 87% of the total population who have a mobile phone do not originate voice calls but do send SMS – it’s for this reason that most people in the world don’t refer to their ‘mobile’ as their ‘phone’ (because while it can be a talking device it’s not owned for it’s voice call purposes but for messaging). I think this is a big misconception. From my experience of the last fortnight talking with hundreds of Consultant Psychiatrists at the RCPsych’s International Congress in London it’s clear that young people are driving transformational change in healthcare services as they simply refuse or avoid using services that fail to modernise. More concerning is the fact that we’re leaving senior citizens behind as we adopt mHealth. Note: There are many things we can do to change this but it’s also critical we appreciate that there are also opportunities to implement mHealth that seniors are already expecting. The rate of change can seem overwhelming but the alternative is wasting your time trying to clinically validate outdated tech. Asking for yet another RCT showing the effectiveness of using SMS or mobile calls instead of stamped addressed envelopes won’t make a piece of difference because there is no logic to printing and sending snail mail in 2014. Why would a rapidly growing mHealth company that has proven it’s mHealth service can save an employer $3,300 per employee per year in healthcare costs and hasn’t yet even got competitors in the market go and waste money and time waiting for more research to further prove that it’s valuable to collect data when the continually improving search algorithms used by Google prove to us everyday the valuable insights that can be made when data is seamlessly collected? Other industries have got over this challenge of being always on (eg. I can use by bank card anywhere in the world even when my local branch is closed) so I see no reason why healthcare is going to different as soon as we all realise a ‘video call to a properly staffed bank of trained nurses with up to date access to all your information’ can achieve more than an email to your nurse (who might be asleep, out at dinner, on holiday, etc, etc) will ever be able to manage. a) The Healthcare experiences we’re all familiar with are fundamentally undocumented or inefficiently documented. b) The product we choose to make should not be visits. c) ‘the 2000 year old model of healthcare is broken forever’. d) mHealth is introducing algorithmic transformation to what healthcare services are possible eg. 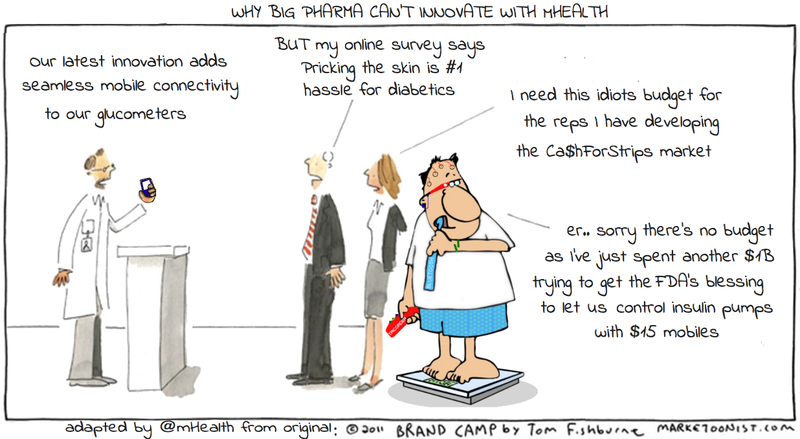 in 10 years mHealth will make many unthinkable things possible. What were your thoughts on the NIH introduction to their mHealth Online Training Course? Related: Click here (on the Healthcare Informatics Society of Ireland website) or here (another page on the mHealth Insight blog) to find out more and book the mHealth for Healthcare Professionals Course that we developed together with the Healthcare Informatics Society.